This incredible piece is the actual document that made Miss Lizzie Arlington the first woman to play professional baseball. Lizzie, born Elizabeth Stride, hailed from Mahanoy City, Pennsylvania where she grew up playing baseball with her father and older brothers. An unsubstantiated story relates that young Lizzie may have learned to pitch from former 33-game winner Happy Jack Stivetts. Whether that tale was true of not, in 1891, 13-year-old Lizzie was tapped to pitch for Mahanoy City’s town team against a touring club of women called the Cincinnati Reds. The teen so impressed the Reds that Lizzie was taken on tour with them. Over the next three years Lizzie, now playing under the name “Lizzie Arlington,” made a name for herself playing throughout the eastern part of the country. Her fame was such that in 1898 sports and entertainment promoter William J. Connor signed her to a contract, then obtained permission from Atlantic League president and (and future Yankees GM) Ed Barrow to sign Lizzie to a minor league contract. Lizzie’s professional contract is somewhat atypical for the time as she is contracted to be paid $50.00 per game along with “all necessary Rail Road and Carriage fares for herself and her maid.” Now officially the very first female to sign with a professional men’s baseball team, Lizzie made he debut on July 5, 1898. Pitching for the Reading Coal Heavers against the Allentown Peanuts, Lizzie entered the game in the 9th inning. The rookie quickly faced Joe Delahanty, the brother of future Hall of Famer Ed, who fouled out. The next batter was Walter Lyons, who grounded out to Lizzie. Jimmy Seagraves singled, Jim Delahanty (another brother of Ed) singled and Charles Boyle reached via a walk. She then got out of the jam by getting George Cleve to foul out to preserve the 5-0 victory for reading. Despite the crowd going wild for the impressive performance and enthusiastic press reports, this would prove to be Lizzie Arlington’s only appearance in the minor leagues. She was supposed to pitch again later in that week in Hartford, but that got nixed at the last minute. She retired, fading from history. Lizzie passed away in 1919, but her breakthrough pitching debut in 1898 made a case for women being accepted by the ranks of professional baseball. The trail she blazed would soon be followed by Alta Weiss, the famed “Bloomer Girl” teams of the 1910’s and ultimately the All-American Girls Professional Baseball League of the 1940’s and 50’s and Ila Borders career in independent league ball in the 1990’s. 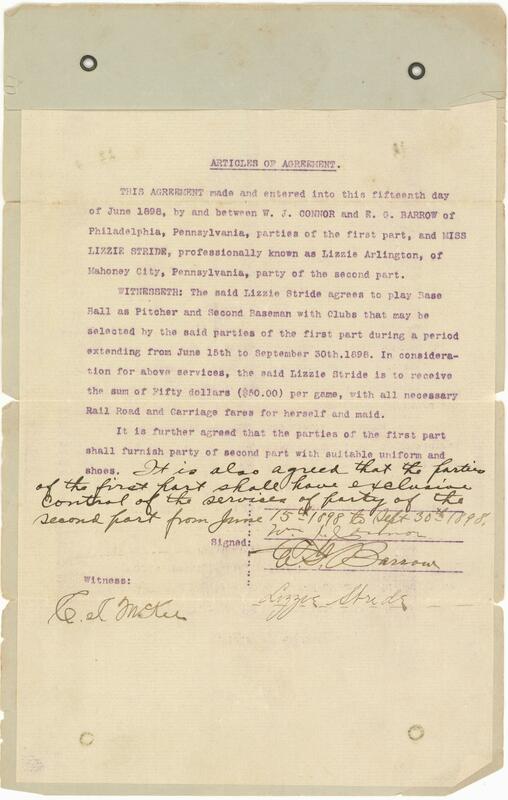 This incredibly historically important document is the actual contract Lizzie Stride signed to make her the first woman in professional baseball. 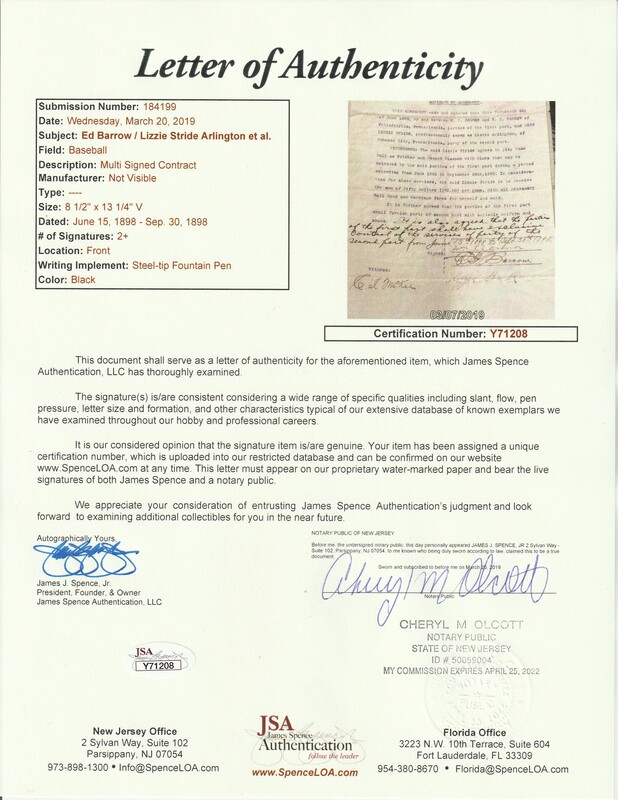 The approximately 8 x 11 ½ -inch, one-sided document is typed with an additional notation in black fountain pen added to the bottom of the agreement. 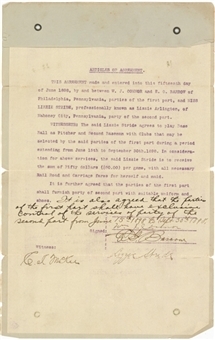 Dated June 15, 1898, just a few weeks before her first and only minor league game, the document has been signed by Lizzie Stride, promoter William J. Connor, Atlantic League president Ed Barrow and witness C. I. McKee. The signatures are in black fountain pen and range from Barrow and McKee’s strong and dark penmanship to Lizzie Stride and William J. Connor’s lighter strokes. The contract shows good edge wear and toning with a corner fold found on the lower right side. The page has been mounted in a heavier document holder and folded in quarters for storage and or mailing purposes. 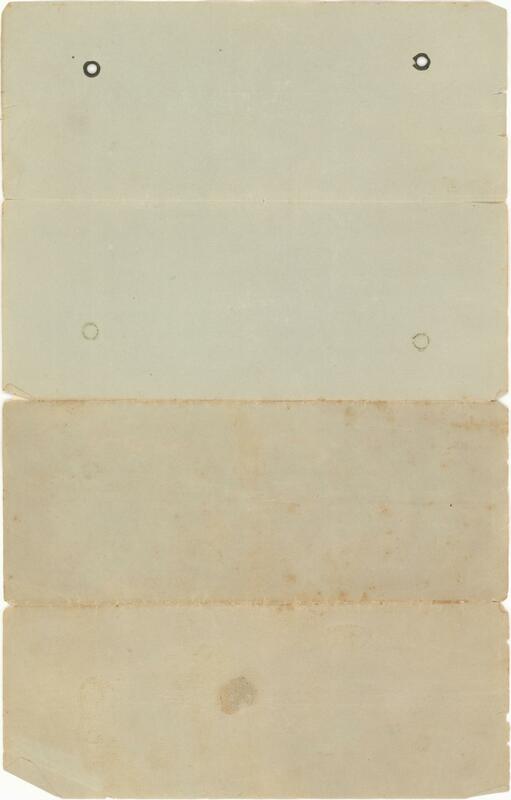 This outer holder has several pieces missing from the fold creases corners, but the contract document remains intact with just the aforementioned creases and toning. A tremendously rare and museum-worthy piece that marks the first time women were accepted to play in the same professional league as men. This item comes with a LOA from JSA for the signatures.